Published in 2007 by the Scottish Mountaineering Trust, Scottish Hill Names: Their Origin and Meaning is the 2nd edition of Peter Drummond's comprehensive work, which first appeared in 1991 as Scottish Hill and Mountain Names. After a day spent climbing Sgùrr nan Gillean on Skye or Merrick in the Southern Uplands, you may well be wondering about the meaning of the name of the summits you have just conquered, and you will find answers to your questions here (Sgùrr nan Gillean, Gaelic for 'peak of the young men'; Merrick, probably from Gaelic meurach, 'pronged, branched, fingered'). The whole of Scotland is covered, from Foinaven in the North to Crifell in the South. Island peaks are included too, such as Heaval on Barra, The Sneug on Foula (west of Shetland) or Conachair on the even more rugged and remote Hirta (St. Kilda). This serves as a reminder of just how many peaks there are in Scotland, and as an additional motivation - if you needed one - to go and explore them. Peter Drummond's book is, to the best of my knowledge, the first and only book of its kind. It is, of course, informed by the work of other Scottish toponymists, such as Alexander MacBain (Place Names: Highlands and Islands of Scotland, 1922), W.J. Watson (especially The History of the Celtic Place-Names of Scotland, 1926), W.F.H. Nicolaisen (especially Scottish Place-names, 1976). One may also think of Diana Whaley's recent publication A Dictionary of Lake District Place-Names (2006), which covers a mountainous area of England in detail. 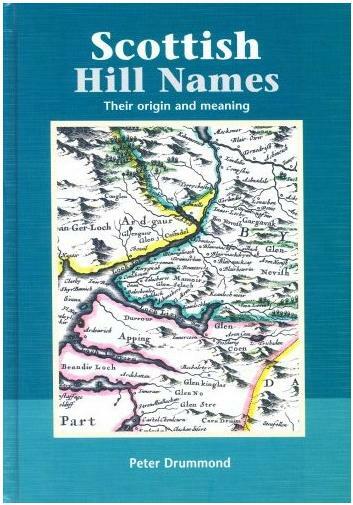 Nonetheless, this is the first book to focus on the mountain names of a whole country in Britain or Ireland. It is aimed at hill-walkers and other outdoor enthusiasts who have an interest in the names of the landscape features they come across in their travels. Peter Drummond is himself a keen mountaineer (hence the support of SMT) and the book is written from the perspective of a walker familiar with the landscapes described and who has built on this experience by carrying out detailed research into the names over many years. A member of the Scottish Place-Name Society since its beginnings, he has been its convenor and is currently its treasurer. He has also had a number of articles published in academic journals on various aspects of Scottish hill toponymy. Drummond's task in researching and writing this book was quite a challenge, since Scotland's place-names are linguistically more varied than Ireland's. No less than six major languages contribute to the mix, and four of these have left a significant mark on hill and mountain names in various areas, namely Cumbric (related to Welsh), Gaelic, Norse and Scots. In many areas of Scotland there are three or even four linguistic layers, so it is no easy matter to establish which language a name is derived from. Early names such as the Ochils (meaning 'high') and Pennygant Hill (which like Yorkshire's Penyghent means 'head of the boundary') are survivals from the Cumbric layer. Gaelic has produced names such as Mullach Buidhe ('yellow summit') or Càrn Mòr Dearg ('big red cairn'), which have close links to Irish mountain names such as Mullach an Aitinn (Mullaghanattin, Co. Kerry) or Carn an Mhadaidh (Carnavaddy in the Cooley Mountains, Co. Louth). Some names, such as Ben Lomond, may have been inherited by Gaelic from the earlier Cumbric tongue, which is a related Celtic language (cf. Welsh llumon, 'beacon', which occurs in Pumlumon (Plynlimon), the mountain on which the Severn rises). Norse accounts for a good share of mountain names in the Hebrides, such Askival, Rum's highest peak, derived from askr ('ash, spear') combined with fjall ('mountain'). The Scots tongue has produced many hill names in the lowlands and near the east coast, such as The Makeness Kips (kip, 'head', denoting a sharp- pointed hill). Inevitably, with such an ambitious project covering such a wide and linguistically diverse area, there are many names open to a number of interpretations, a point which Peter Drummond makes clear in the introduction. He makes no apology for presenting several possible derivations for a single name, though he often expresses a preference for one. In the case of Ben Nevis, a particularly problematic name, MacBain's suggestion of the root neb-, 'cloud', is preferred to Watson's nem-, 'venom' (p. 138). Regarding the Cuillin, a good case is made for a Norse derivation rather than a Gaelic one, though the Norwegian name that supports this is Kjølen rather than *Kjolen, and the meaning is 'the keel' rather than 'high rocks' (p. 86). I would suggest that a Celtic origin could be considered just as likely for The Storr and The Old Man of Storr as Old Norse stórr, 'big' (p. 89), which has the drawback that one must assume an accompanying noun has been dropped. 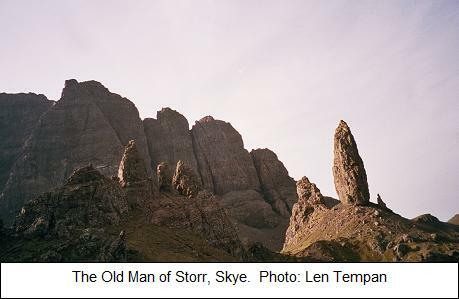 The word starr is defined in Dinneen's Irish-English Dictionary as 'a projection; a stump, tooth or tusk', a meaning which nicely suits not only the rugged pinnacle on Skye, but also the other Old Man of Stoer on the coast of Sutherland. The form storr is given as a variant of the same word. The Scottish Gaelic equivalent, stòr, is defined by Dwelly as a 'steep, high cliff' or a 'broken or decayed tooth'. It is likely that these words are ultimately derived from torr, also meaning 'a projection' and common in names of prominent rock features, with the addition of an s- prefix which is so common in Gaelic, English and many other European languages. There are occasional problems of spelling, particularly due to the large number of languages involved and their various historic phases. 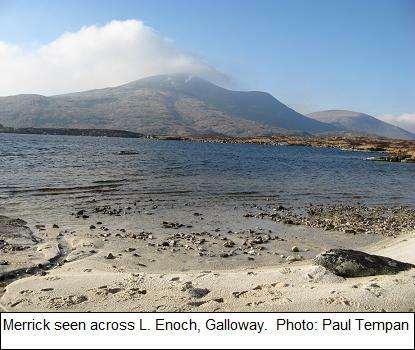 The Old Irish form equivalent to Scottish Gaelic beinn is benn or bend, not ben (p.20). The Welsh equivalent is ban (plural bannau), not bann (ibid.). Also the reconstructed Welsh form which explains Pennygant Hill would be *pen y gant (from cant, 'edge, border') rather than *pen y ghant (p. 49). However, most of these slips are minor and do not detract from the arguments being made. Overall, the text is reliable and informative as well as entertaining. Pronunciations are provided for each of the Gaelic elements listed and for those Gaelic hill names which have a paragraph of their own in the regional chapters. John Mitchell's attractive line drawings have been retained and some colour plates have been added, which greatly enhance the 2nd edition. These serve not only to illustrate the landscape features dealt with in the text, but also to give an overview of the history of mapping Scotland's mountain terrain. Sections of historical maps by Pont, Blaeu and Armstrong are reproduced, and an annotated panorama of the Lowther Hills allows one to compare the modern names, taken from OS maps, with the names of the same hills as they appeared on Timothy Pont's map in the 1590s. This material gives us an interesting insight into the work involved in researching Scottish hill names. The second edition benefits from the research which the author carried out for an MSc dissertation at the University of Edinburgh into the hill names of Southern Scotland. Accordingly, the section on the Southern Uplands and the Central Lowlands have been expanded. Whether you tackle it peak by peak or all in one go, Scottish Hill Names: Their Origin and Meaning is an informative and fascinating read, and at RRP £15 it is excellent value. It is thoroughly recommended to all walkers, from ramblers to munroists, with a curiosity for names in the Scottish landscape. Irish mountain names and their international links. by Paul Tempan.